Fox was interred in the Bucquoy Road Cemetery, his original wooden cross bearing the inscription ‘Known to be buried in this cemetery’. (i) Two letters from the head of the Church Lads Brigade at Cirencester to the recipient’s uncle, the first, dated 9 September 1916, being a congratulatory message on hearing of the award of his D.C.M. 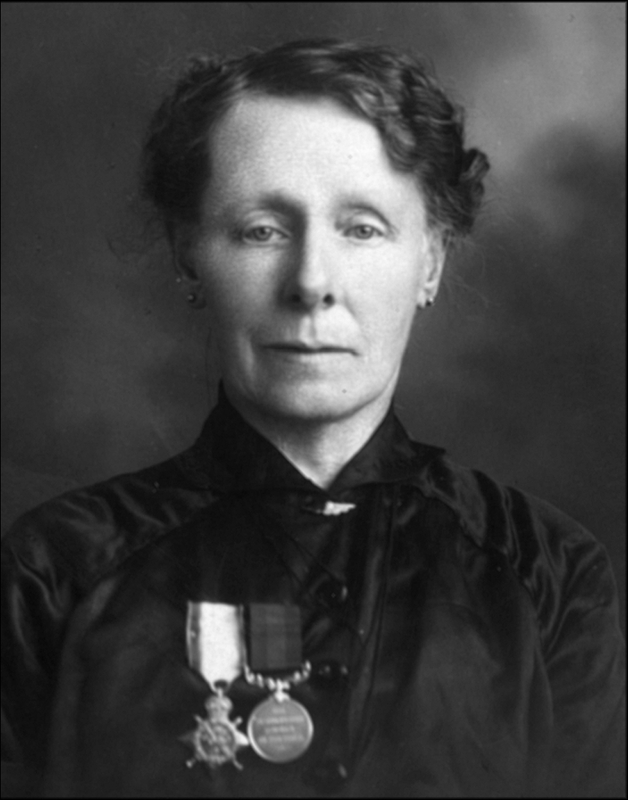 (‘ ... We forwarded news of his gallant action to our Headquarters in London and they have written requesting us to secure them a copy of Herbert’s photograph for reproduction in their official magazine, “The Brigade” ...’), and the second, dated 9 May 1917, a message of condolence. (ii) Two letters from the Headmaster of Powell’s Boys’ School at Cirencester, one addressed to his uncle and the other to his aunt, the first, dated 31 August 1916, being a congratulatory message on hearing of the award of his D.C.M., and the second, dated 17 May 1917, a message of condolence (‘ ... My recollections (which are very distinct) of him as a school boy are that he was steady, industrious and conscientious. His later life - especially as a soldier - fully showed how those qualities had developed. 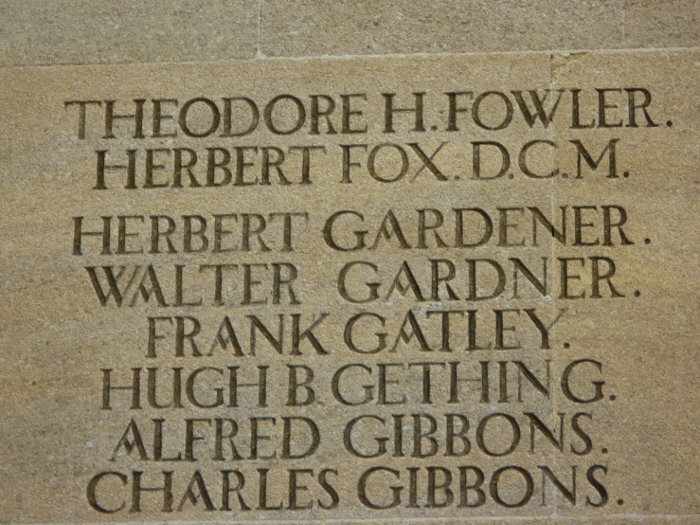 I am proud to have had him in school ...’); and another letter of condolence from a church goer in Cirencester, who clearly knew Fox in his youth, dated 23 April 1917. (iii) Letter of condolence to his mother from 2nd Lieutenant W. R. Wood, O.C. of ‘A’ Company, 2nd Wiltshires, as reproduced above, complete in its ‘On Active Service’ envelope and date stamped 17 April 1917. (vi) Two official communications regarding the recipient’s burial site, one of them from the Imperial War Graves Commission, with photograph, and the other the Army Record Office at Exeter, dated 9 January 1918, with exact location near Arras. (vii) Three contemporary photographs, two of them of the recipient in uniform, and the other, poignantly, of his mother wearing his D.C.M. and 1914 Star. 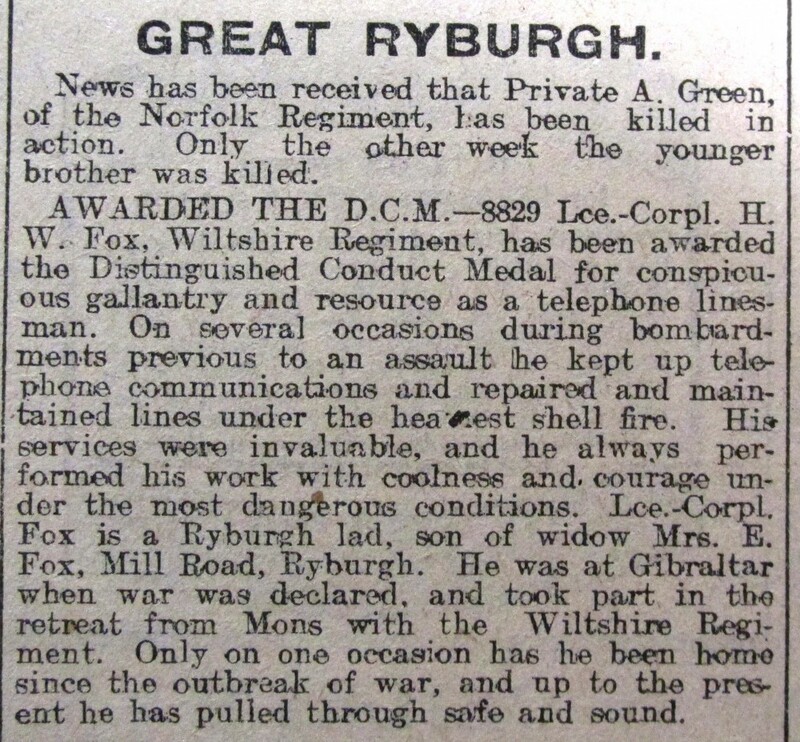 Corporal Herbert Walton Fox, 8829 2nd Battalion Wiltshire Regiment. 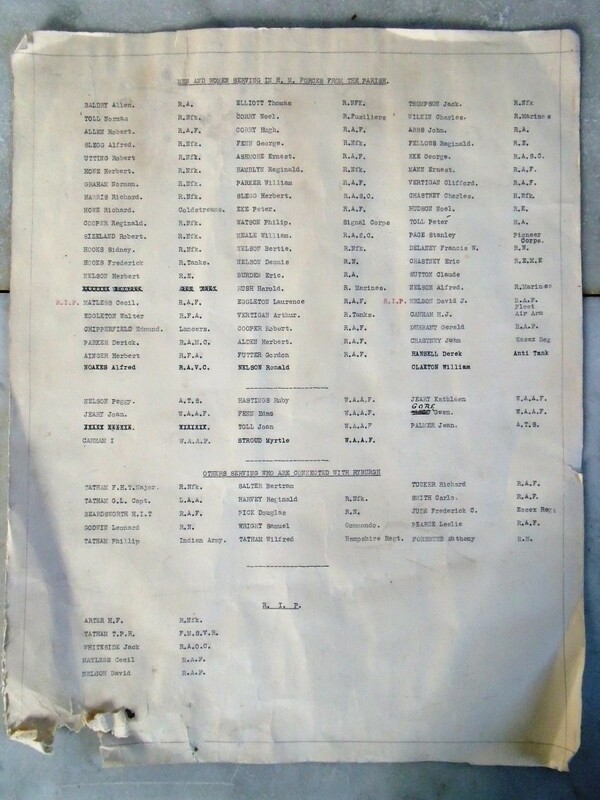 Killed in Action 9 April1917 at the Battle of Arras, more precisely the first day of the Battle of the Scarpe. He has no known grave and is commemorated on the special memorial in Bucquoy Road cemetery Ficheux near Arras. Son of Mrs A. E. Fox a widow of Great Ryburgh, he was 22years old when he died. A regular soldier, his regiment was in Gibraltar at the outbreak of the war. 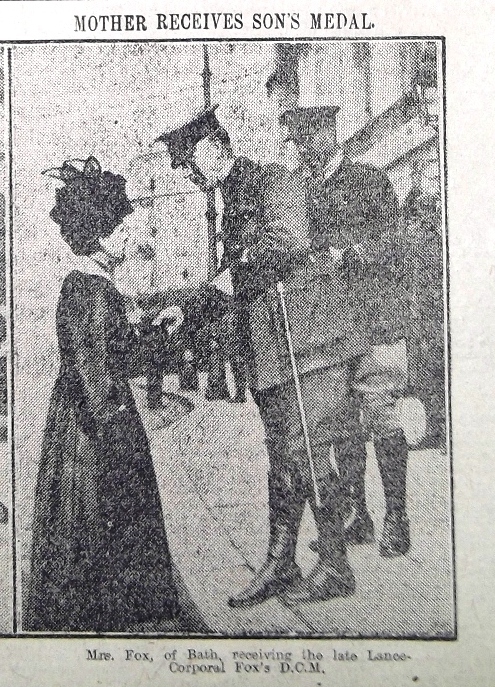 His regiment returned to England on September 3rd 1914 landing at Southampton. Attached to the 21st Brigade 7th Division they landed at Zeebrugge on the 6th October 1914 and were involved in the defence of Antwerp and then became entrenched in front of Ypres. In 1916 at the time of the Battle of the Somme he was in an area known as “Happy Valley” later to be more rightly known as “death valley”. This area is where the famed poet Siegfried Sassoon fought with the 38th Welch Regiment and was the scene of many a bloody battle. It was here that Herbert was awarded the Distinguished Conduct Medal for bravery on the 28th July. Although he had survived some of the most bloody and costly encounters of the war and been decorated for bravery, his luck was not to last. 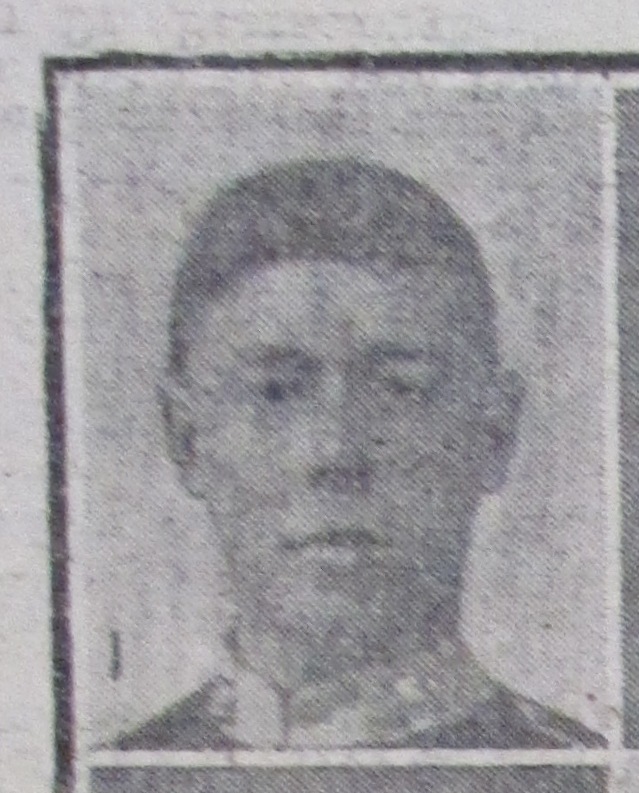 On the 9th April 1917 he was killed in action during the Battle of Arras and his body was never found. It is worth noting that in all this time he had only been home on leave once in nearly 3 years. He appears on the Village Hall Memorial that forms the Procenium Arch to the stage. St John the Baptist, The Market Place War Memorial . 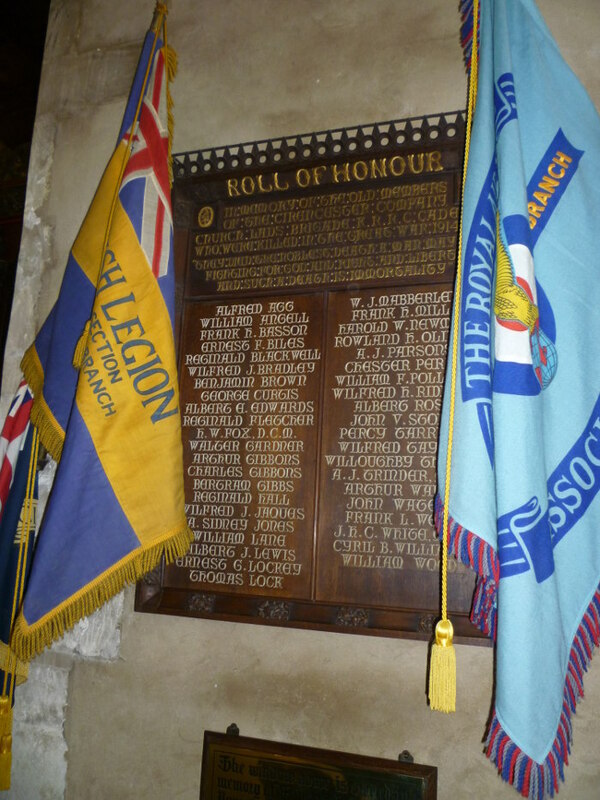 The Church Lads' Brigade Memorial, St John the Baptist Church. Apsley Hall War Memorial Hospital, Sheep Street. who supplied the memorial photographs above. Herbert is mentioned twice in the pages of the Dereham and Fakenham Times. 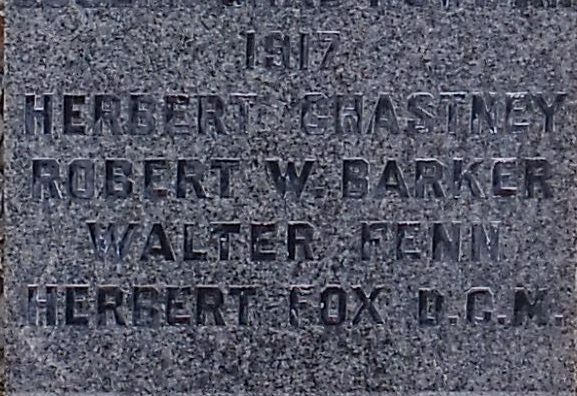 Herbert was the eldest of the 3 children born to Harry Fox and Amy Emma Peeling. Harry was born in the last quarter of 1865 in Burnham Deepdale .His father Henry was a farm bailiff and his mother, Dinah a dressmaker. Harry was apprenticed to a blacksmith at Great Bircham by the time he was fifteen, but had returned to work on the land with his brother and father in Gateley by 1891. He married Amy Emma Peeling daughter of Walton Peeling and Amy Howe in the last quarter of 1893. October 1892 had seen the marriage of Harry’s younger sister Clara to a George Nelson at St Andrew’s. Amy Peeling was one of the witnesses to sign the Register on that occasion. Cecil Harry born 13th. March1900. They were next door neighbours of George and Clara Nelson most likely in the three cottages that are now known as The Stone House. These are undoubtedly the circumstances that occasioned Herbert’s move to Wiltshire and into the care of his Uncle George and Aunt Hannah Elizabeth Smith. Hannah was Amy’s older sister born in 1861. In 1911 the 16year old Herbert is working as a domestic under gardener. In 1911 The Census shows Amy widowed and a “Washerwoman “ now living in Mill Road in the same area of Mill Road as the Bond family had lived before moving to Mill Terrace. Cecil Harry now 11 is at school. He left in October 1913 and went to be a Farmhand complete with Certificate of Att. 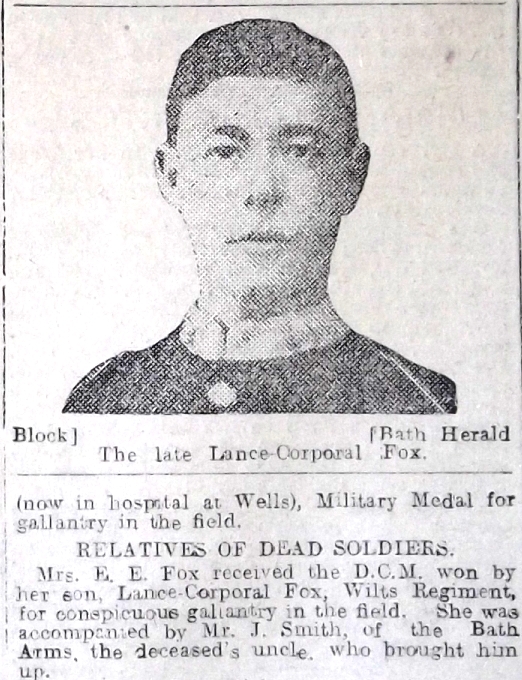 Cecil also enlisted and is recorded on his Medal Index Card as Harry Fox Pte, Regt No.4428 and 202150 following his older brother in the Wiltshire Regiment. In 1909 Herbert and Cecil have a new half sister,May Maria Fox. There is no record of her father and she was not baptised at Ryburgh possibly due to the change of Rectors at the time. Tragedy hit the family once again in the 1939-45 War when May’s husband, Stibbard Gamekeeper Richard Reginald Harvey died in Malaya in 1942. They had only been married since March 1939. 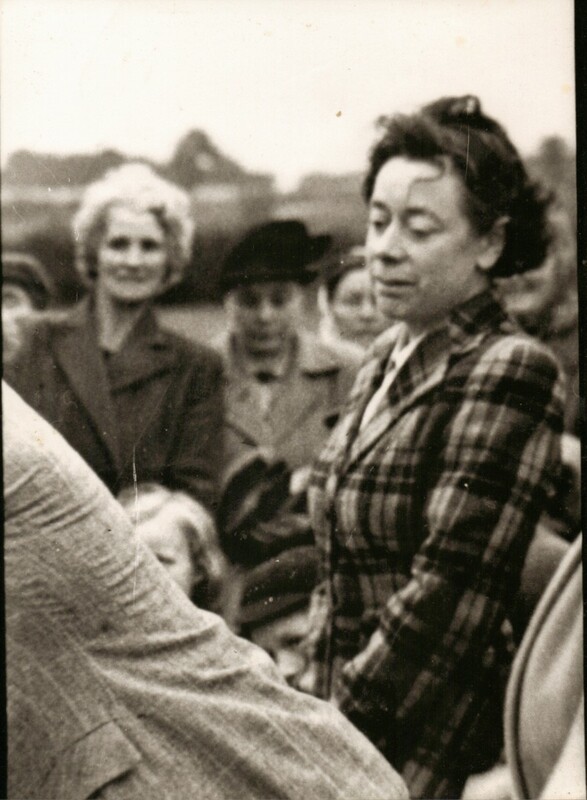 May Harvey, pictured here in the 1950’s was a life long church member and lived in one of the cottages that is now part of Melody Terrace. She is herself remembered in the church by the flower stand that is so regularly alive with colour inside the church porch. Having been too old for the war can’t have been easy for George and he must have given much thought to this course of action that allowed him eventually to play his part. There were probably no medals for him despite his grim task. 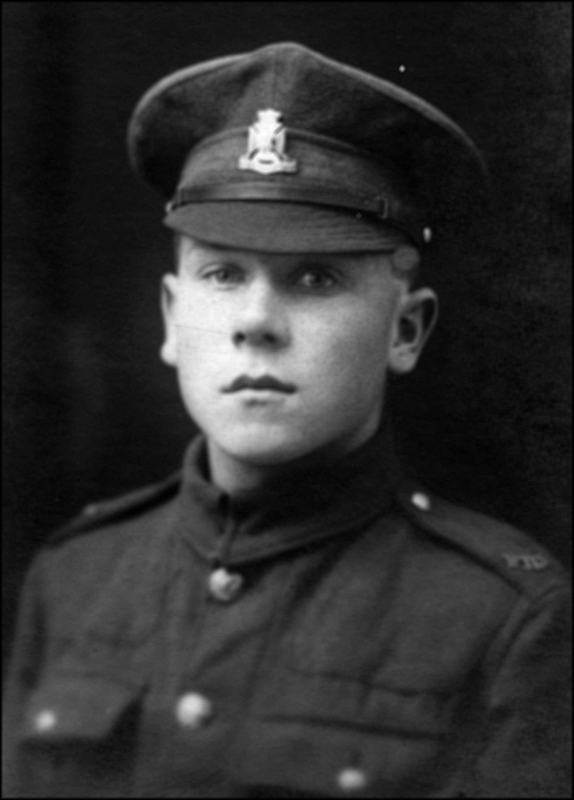 However, did the thought that he might find the body of his dead nephew and give his sister the chance to come to terms with her loss sustain him throughout those horrendous few months in 1919-20.? One can only hope so.